AcademicsSchoolsSchool of PharmacyOur News172 Student Pharmacists Complete Advocacy Trip To Washington, D.C.
As part of an inter-professional event, students, faculty and staff from Duquesne University School of Pharmacy and Duquesne University School of Law traveled to Washington, DC from October 20-21 to meet with their senators and representatives to advocate on behalf of legislation that would grant provider status to pharmacists under the Social Security Act. There were 172 student pharmacists from the School of Pharmacy, representing the Weekday Pathway class of 2020 and the Weekend Pathway class of 2019. Sixteen law students from Professor Rhonda Hartman's Healthcare Law Class were also in attendance, as well as 9 faculty and staff. 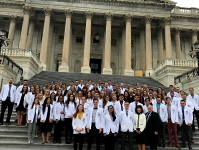 According to Dr. Janet Astle, Assistant Dean for Student Services in the School of Pharmacy, the students visited the offices of 15 senators and 35 representatives to discuss the role of the pharmacist in addressing the nationwide opioid crisis, as well as the provider status bills entitled Pharmacy and Medically Underserved Areas Enhancement Act (HR 592 and S109). If enacted, this legislation would recognize and compensate pharmacists for their role as health care providers in working with medically underserved areas, underserved populations, and areas with health professional shortages. Astle said that pharmacists can promote positive health outcomes and reduce overall healthcare expenditures across the Medicare population. "As the most accessible healthcare provider, pharmacists are able to reach a population that otherwise might not have access to healthcare. Services and interventions provided by pharmacists can help to improve health outcomes of patients and their communities while minimizing downstream healthcare costs - by keeping people healthy, keeping them out of hospitals and emergency rooms." She added that the opportunity for student pharmacists to work with law school students "provided a novel collaborative approach to inter-professional education. Through this experience, the students were able to learn about, from, and with one another. The expertise provided by the law school students relative to legislative processes further assisted student pharmacists in their efforts to advocate on behalf of the pharmacy profession and its outreach to underserved populations."